Just about a month after releasing the android 8 Oreo update for the Xperia XZ Premium, Sony has decided to roll out the Oreo update to 2 more devices which are the standard Xperia XZ and Xperia XZs, both of which were launched about a year ago and still stand a chance of receiving one more major update. The new software update comes with firmware version 41.3.A.0.401 and the size is around 1.2GB. 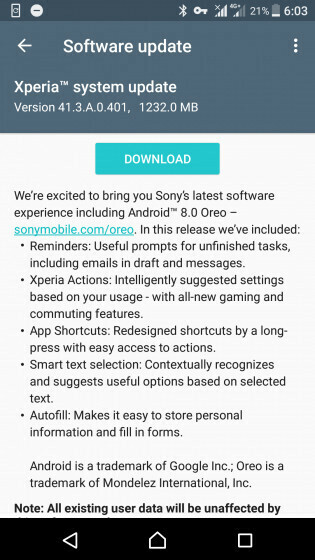 According to Sony, the update includes tye standard android Oreo new features and improvements as well as Reminder, Xperia Actions, suggested settings based on your usage, App Shortcuts, Smart text selection, and Autofill. As well as the latest November security patch. If you own the Xperia XZ or XZs then you probably should have received the update notification, but incase you haven't then it should be available later on this week. Also, if you are using the Xperia X Performance then you should get ready as that might be the next device to receive the Oreo update and it will most likely roll out before the end of the year.